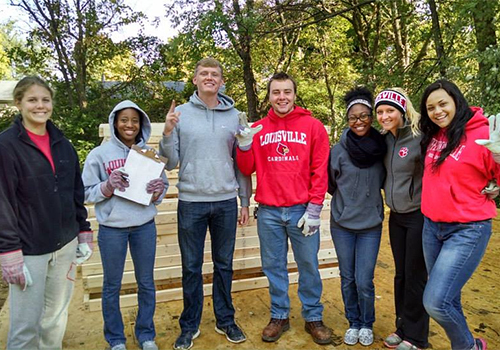 Students from the University of Louisville chapter of Habitat for Humanity volunteer their time to help build a home. Millennials aren’t as self-obsessed as you think. Those 14-to-34 year-old members of the so-called ‘Selfie Generation’ have more self-sacrificing aims too, and research into the habits of millennials consistently points to a group with a strong desire to create change in the world. Research by CWB reveals that 84% of millennials say the knowledge that they’re making a positive difference in the world is more important than any professional recognition, while recent studies by Barnes & Noble College into the Millennial Mindset have also uncovered a need to make an impact on society and their communities. In particular, volunteering was considered extremely important by 70 percent of college freshmen, and 79 percent of juniors and seniors. It’s statistics like these, which underline the thriving success of the campus chapters of Habitat for Humanity. 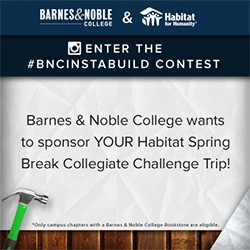 Now in its third year of partnership, Lynda Smith, Corporate Relations Director of Habitat for Humanity International, sees the collaboration with Barnes & Noble College as the perfect way of engaging the various campus chapters. “In the way that we design the programs, it’s been a great opportunity for Barnes & Noble College to interact with their audience, and an engaging way for students to give back to Habitat,” she says. 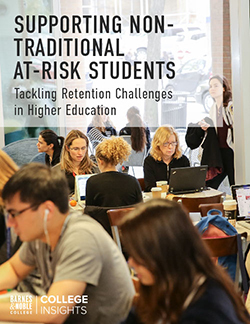 Keeping those campus chapters engaged is easier when you tap into that millennial familiarity with social media, and then include the added element of competition. 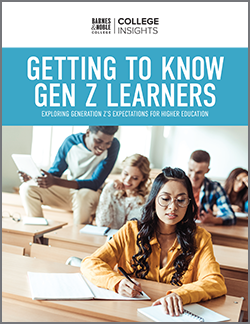 “When we’re designing a new program, we want to keep it fun, fresh engaging,” explains Sandra Webb, Social Media Specialist at Barnes & Noble College. This year’s program is specifically directed at engaging the campus chapters with the opportunity to be part of the Collegiate Challenge, a particularly successful Habitat program, where the chapters can choose from 200 destinations around the country to volunteer over Spring Break. Although Smith points out that choice of location is up to the chapter, whenever there is a particular need, such as support after Hurricane Katrina, the volunteers are always eager to accept disaster challenges as a preference. To participate, the chapters had to create an Instagram video explaining why they love Habitat and then submit their entry to Barnes & Noble College. The entries receiving the most votes were shown to a judging panel that chose the top two entries, with each receiving $5,000 to cover expenses for their spring break Collegiate Challenge trip. Ohio Northern University students volunteer with their local chapter of Habitat for Humanity. The entries received showed the broad diversity of the campus chapters. “We had a really tight race between Columbia University, Ohio Northern, University of North Carolina Charlotte (UNCC), University of Louisville and Marist College. It’s not just the big schools — schools of every size participated and were really committed to helping their teams win,” Webb says. The entries also showed endless creativity; chapter members holding up signs about what Habitat means to them, forming human pyramids and adding their own soundtracks. At the Habitat International Offices in Atlanta, Smith enjoyed looking through the entries. “It was fun to be able to see how much time and effort the students put into their videos, and the kind of creativity they showed to win the contest,” she says. The winners of this year’s Barnes & Noble College Challenge were announced on December 5 and the University of Louisville and Columbia University came out on top. Through the efforts of thousands of dedicated volunteers, including college students from across the country, Habitat’s vision of a world where everyone has a decent place to live will continue. “We’re focusing on how many lives we can help by the work going on with our 1,450 affiliates around the country, and also in 70 countries outside of the United States,” says Habitat’s Smith. In the meantime, Habitat for Humanity International’s Ninth Annual Youth Leadership Conference & Young Leaders Summit met recently in Charlotte, North Carolina. The event celebrated and recognized the contributions of the more than 50,000 young people Habitat has engaged on campuses and throughout communities during the past year, in a movement that has helped to build or repair more than 800,000 houses and serve more than 4 million people worldwide. Which you have to admit is no small effort for a group of self-obsessed millennials.